Phindy's Place is featuring Operation Write Home in honor of our 2nd birthday celebration on their challenge blog! This challenge lasts from today until September 23, 2010. 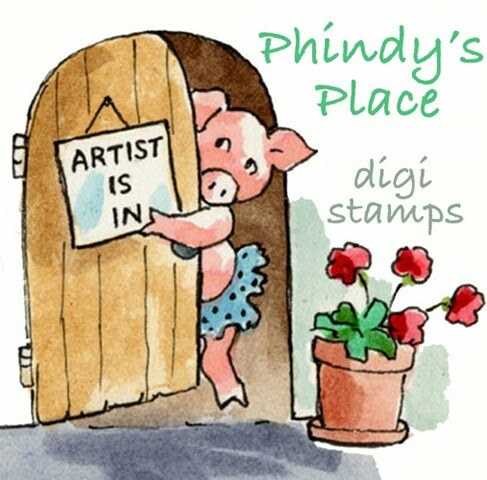 Phindy's Place Digi Stamps is the creation of children's book illustrator Philomena O'Neill. She has hundreds of charming, well drawn images to choose from, with several lines featuring special characters such as the popular "Mrs. Comfy", "Summer Cuties" and "Sweet & Salty." Phindy enjoys creating digi stamp images and sees the combination of her ink line drawing and the crafter who colors and embellishes the image to create a unique finished card as a collaboration between two artists. Here's a link to the Phindy's Place challenge blog so you can play along! It's wonderful to learn about Phindy's adorable digis and children's books!! Thanks!